We hope you had a good time at the Open Day at UEA. 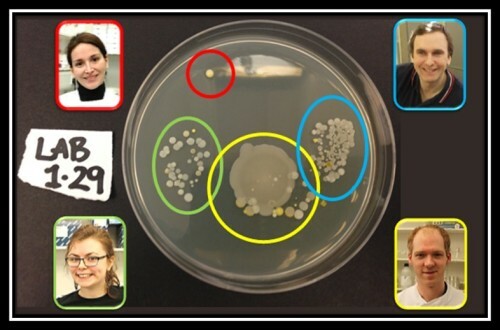 It was great to see so many keen scientists visit us in the Lab, and, as promised, here are the bacterial fingerprints of everyone who dared to try it! They all look very impressive and mixed, so thank you for participating and hopefully you can remember which number was you. We also included a plate of our own fingerprints, and a demonstration of the importance of washing your hands – especially if you work in a microbiology lab! Good luck with your studies and results! 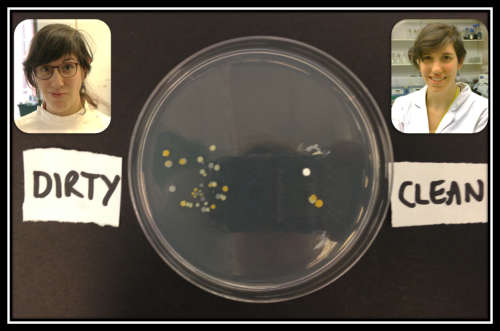 Jon, Beth, and Andy did a good job collecting bacteria on their fingers! However, Ornella washed her hands and her fingerprint is a good proof of that! Ana washed her hands, touched the keyboard and then left a fingerprint rich in micro-life. Luckily, most microorganisms present in our skin can be washed away with some soap and water! Search below for your fingerprints!